Vikings fans had a tough time in Philadelphia last season, but did any of them have their rental car burned to a crisp by a grill in the stadium parking lot? Much was made nine months ago about the awful treatment Vikings fans endured from Eagles fans during the 38-7 NFC title game loss in Philadelphia. To the best of my knowledge, though, not a single Vikings fan had his or her car burned to a crisp in the Lincoln Financial Field parking lot. That treatment — albeit accidental — was saved for Sunday’s game at the New York Jets and included especially unlucky Vikings fan Gina Smith. Smith was on a trip to Boston to celebrate her birthday and decided it would be fun to make a day trip to New York for the Vikings/Jets game since the schedule lined up nicely. She said her group bought a parking pass at a MetLife Stadium lot and went into the game — a sometimes dull but enjoyable 37-17 win for the Vikings, at least from the perspective of a Minnesota fan. According to NJ.com, there were two separate fires in MetLife Stadium lots on Sunday impacting seven cars. Both fires were blamed on hot coals from tailgaters. Smith said she is inclined to believe it was a terribly stupid but careless accident. 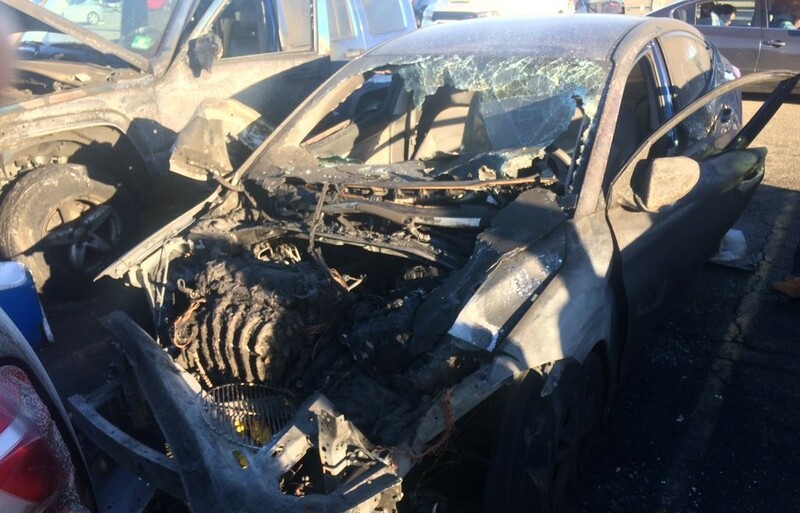 It was a typically windy day (just ask Vikings kicker Dan Bailey about that), so the notion that someone didn’t put out a fire completely and that it spread to her car (and others) is very plausible. With her rental car burned beyond recognition, Smith’s bad day was just beginning. The rental company suggested she and her group take a taxi home instead of getting a new car, which wasn’t exactly possible given they were coming from four hours away in Boston. Police arrived and made a report but, according to Smith, said the incident is beyond their jurisdiction because it happened on MetLife Stadium property — but they also told her the stadium isn’t liable for things that happen on their property. The only kind soul: A parking lot attendant took pity on Smith and her crew and gave them a ride to the Newark Airport to get a new rental car. The kicker: Smith didn’t purchase additional insurance through her rental car company, so she’s currently battling with MetLife Stadium folks to cover the cost of the deductible through her insurance. “Honestly, when getting our rental car the thought that we should get the extra insurance because Jets fans might burn our car to the ground never crossed my mind,” Smith said.